I am delighted you are joining us for this ExploreGB educational trip and I hope you enjoy your time touring Great Britain. My Product Development Team in London have been working incredibly hard over the past 12 months to ensure you have a fantastic trip – visiting top attractions, hotels and destinations which you can sell to your clients. Enclosed within this booklet you will find a detailed itinerary of your educational trip, along with a comprehensive map and contact details for all the suppliers you will be meeting with throughout the tour. 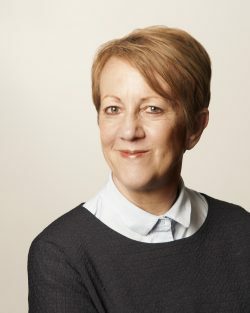 I hope this ExploreGB experience provides you with the inspiration and contacts necessary to educate your customers and deliver your own tours to Great Britain. 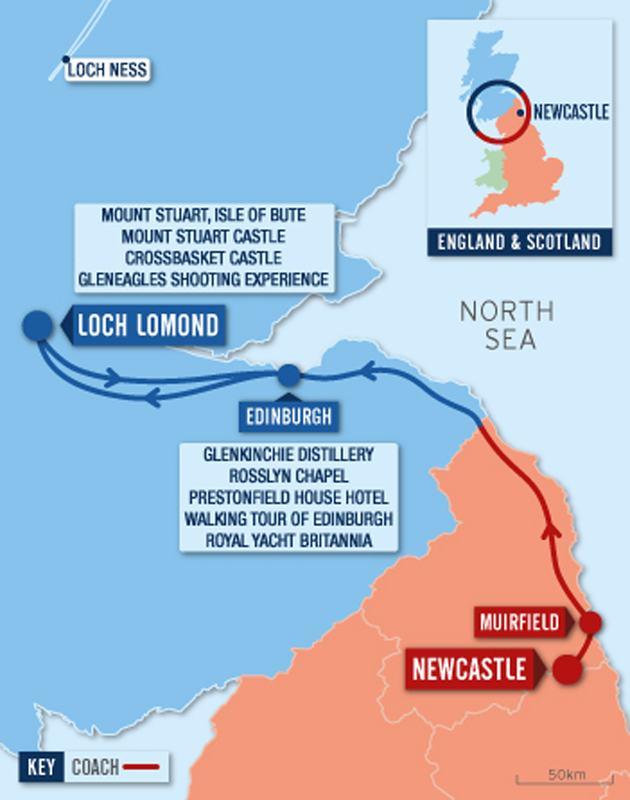 Beginning in Newcastle, in North East England, this itinerary starts with a coach transfer to North Berwick, in Scotland, taking approximately 2.5 hours. Known for its majestic coastal setting,Victorian architecture and indulgent spa, the Macdonald Marine is also home to the award-winning Craigleith Restaurant which serves a range of fine, local produce. Profile Macdonald Marine Hotel & Spa in North Berwick is renowned for its beautiful coastal setting and glorious 19th century Victorian architecture. Situated on the East Coast of Scotland, our North Berwick Hotel has 83 unique bedrooms to choose from - a world of four star luxury. Macdonald Marine Hotel & Spa boasts extensive conference facilities and a luxurious spa complex making it the ideal base for business stays as well as leisure breaks. Our North Berwick hotel is also home to the award-winning Craigleith restaurant, where you can enjoy the finest Scottish cuisine in a very Scottish setting, with views of the Firth of Forth. Our Macdonald North Berwick hotel is also the perfect choice for golfers, who can choose from 20 championship courses in the surrounding area. As Macdonald Marine Hotel & Spa is within easy distance to Edinburgh by car or rail, you have the option of both the quiet tranquillity of the seaside and the busy tourist attractions the city has to offer, including Edinburgh Castle and Edinburgh Zoo. Catering for a wide range of functions and occasions such as weddings and business events, Macdonald Marine Hotel & Spa offers a luxurious experience in a beautiful coastal setting. The medieval fortress of Dirleton Castle has beautiful gardens and historic, rugged ruins, while the hilltop Tantallon Castle – just 15 minutes’ away – overlooks the wild East Lothian coast. It stands opposite the iconic Bass Rock and is a truly romantic spot. As for the Gullane Berts beach, on a fair day, this is an ideal spot for sunbathing, walking and water sports such as kayaking. No visit to Scotland is complete without a taste of one of its finest exports – whisky! A guided VIP experience tour of the Glenkinchie Distillery includes five different tastings and the chance to try some cask samples too – giving an real insight into the creation of this great flavour of Scotland! Onwards towards Edinburgh, and for anyone who has read or watched The Da Vinci Code, the site of Rosslyn Chapel may seem familiar. With fascinating architecture, intricate carvings and beautiful stained glass windows, this chapel played a part in Dan Brown’s thrilling novel. One of Edinburgh’s finest buildings, and just 5 minutes’ from the city centre, the 5-star Prestonfield House Hotel boasts 20 acres of gardens, an enviable location near Arthur’s Seat, and the stylish Rhubarb Restaurant – wonderful for lunch, and exuding style and glamour. With so much to see and do in this vibrant city, the ‘Secrets of The Royal Mile’ tour offers the chance to hear some of the Scottish capital’s most thrilling tales in just 90 minutes. Discovering the city on foot, the tour explores Edinburgh’s hidden lanes, through courtyards and buildings, offering the chance to learn about its most fascinating figures and buildings. Still within the city, a peek behind the doors of the Palace of Holyroodhouse gives a rare glimpse of life inside the Queen’s official Royal Residence in Scotland. With opulent State Apartments, a decadent Throne Room and some of the country’s greatest gems and treasures, it’s a fascinating insight into the Royal family, its traditions and heritage. This day of discovery ends at The Hilton Glasgow Grosvenor – a blend of the historic and the modern. For those who enjoy a good steak, its Bo’Vine restaurant offers cuts of fine Scottish beef, cooked to perfection. Profile In 1825, farmers John and George Rate built and operated the distillery under the name Milton Distillery until it was licenced and renamed in 1837. Though it was transformed into a sawmill in 1853, the distillery eventually returned to its ‘natural state’ – and much-improved – state, becoming the redbrick Victorian masterpiece we know today. Profile Edinburgh's most exciting five star hotel exudes opulent individual style that is unrivalled anywhere else in the city. Built in 1687 as the grand baroque home of Edinburgh's Lord Provost, Prestonfield is now Edinburgh's highest-rated hotel and home to the destination restaurant - Rhubarb. Alongside Rhubarb, and Edinburgh's most luxurious rooms and suites, Prestonfield features a collection of stunning private dining rooms, opulent salons, a whisky bar and historic public rooms perfect for afternoon tea. Outside twenty acres of gardens provide seclusion, a place to enjoy a drink, enjoy tea on the terrace, walk your dog, park for free or, should you wish, land your helicopter! Perfectly Situated Just five minutes from Edinburgh's finest shopping streets and the historic attractions of the Royal Mile adjacent to Holyrood Park, Prestonfield provides the privacy and seclusion of a country estate. Look no further for one of the best hotels in Edinburgh, perfect for romantic breaks or extended secluded stays. Profile Mercat Tours are the original five-star history and ghost tour company in Edinburgh. Established over 30 years ago, our accredited guides bring Edinburgh’s stories to life every day. We offer daily tours from 10am to 10pm with experiences in English, French, German, Spanish & Italian. Min - Max capacity: No minimum, max 30. Profile Set in a historic building with a modern and stylish interior, Hilton Glasgow Grosvenor is the perfect place to stay when visiting Scotland’s biggest city. Set in the bustling West End of Glasgow, just minutes from the city centre via subway, walking distance from Glasgow University and overlooking the Botanic Gardens, our hotel is in the ideal location. Excellent transport links are available to the SECC and the Hydro, and Glasgow International Airport is just a 20 minute drive from the hotel. The Isle of Bute is a secluded spot, where picnics and wildlife spotting is the order of the day. It’s also home to the stunning Mount Stuart Castle, a Victorian Gothic mansion complete with white marble chapel. A guided tour of this 19th-century gem explores the award-winning visitor centre, the beautiful gardens and one of the most impressive private art collections in the UK. After working up an appetite, lunch in the on-site Bute Kitchen gives the chance to sample a range of traditionally Scottish ingredients. Dinner this evening is at the luxurious and unique Crossbasket Castle – winner of Scottish Hotel Castle of the Year 2017. With a riverside setting and with just nine en suite guestrooms, this retreat is the epitome of peace and tranquillity, with a restaurant overseen by legendary chefs Albert Roux and his son, Michel Roux Jr. Profile We operate throughout Scotland's Hebridean and Clyde islands, stretching from Arran in the south to Lewis in the north. Operating 475 sailings per day in summer and around 350 per day in winter, we carry in excess of 4.9 million passengers per annum. We look forward to welcoming you on board soon! Profile Mount Stuart House and Gardens are located on the beautiful island of Bute. Bute is only 33 miles from Glasgow. It is the most accessible of the westerly isles from the Scottish Central Belt. It’s a peaceful island haven, just a stone’s throw away from the mainland. The spirit of nineteenth-century invention is embodied in Mount Stuart – a feat of Victorian engineering, this neo-gothic mansion was one of the most technologically advanced houses of its age. Ironic, when you consider the medieval inspiration of the Gothic Revival. Set in 300 acres of grounds which include designed gardens, woodland and coast there is something for everyone at Mount Stuart! Profile Sensitively renovated, Crossbasket is a stunning 17th century castle transformed into one of Scotland's most luxurious hotel and event venues. Steeped in history, Crossbasket Castle has many unique period features which have been restored to their original beauty using traditional craftsmen and materials. The Stewart Drawing Room is a perfect example of the quality of restoration featuring uniquely detailed cornices finished in gold leaf to ensure these features convey the magnificent grandeur typical of this era. The perfect luxury retreat for guests looking for peace and tranquillity, Crossbasket features nine breath-taking en-suite bedrooms each decorated in a classical style and named in honour of a historical custodian of this magnificent castle. Each bedroom is individually crafted and strikes the perfect balance between traditional character and modern finishing. Authentically charming, Crossbasket’s four-story bridal tower dates back to the 16th century as part of the preceding Mains Castle. The fairy-tale turret room, built on a hill overlooking the Calder river, is served by a sweeping spiral stone staircase. A true one-off, it is the ultimate bridal suite. Also available as self catering accommodation is Gate Lodge, which is a traditional two bedroomed house, located at the entrance to the Crossbasket Estate on Stoneymeadow Road. Approximately a three minute walk from the Castle, it is perfect for families, or for those looking for a five star experience with the amenities of home. Dine in opulent surroundings at the latest contemporary fine-dining restaurant from the Roux culinary dynasty. Overseen by the legendary French chef Albert Roux and son Michel Roux Jr, dishes showcase fare from Scotland’s renowned natural larder with an added touch of creative flair from the iconic Roux team. The castle grounds include a large stretch of woodland, extensive nature walks and a beautiful stretch of river featuring majestic waterfalls. The convenient location means there is plenty to do and see locally, including golfing, fishing and hiking. 11:00 45 minutes of Shooting Experiences including clay shooting, air rifle & archery. This morning starts with an action-packed visit to Gleneagles Hotel, which offers a range of outdoor activities and pursuits on the estate – from shooting, horse riding and fishing, to falconry, cycling and tennis. Onwards to the Queen’s floating Royal residence, the Royal Yacht Britannia – one of Scotland’s most popular attractions. It has covered over a million miles around the world, has seen Sir Winston Churchill, Nelson Mandela and Rajiv Gandhi step onboard, and has many a Royal story to tell. Dinner this evening is at The Principal Edinburgh George Street Hotel, built in 1775. Today, it offers luxurious accommodation full of Scottish heritage and culture and a contemporary restaurant serving Scottish dishes at The Printing Press Bar & Kitchen. Profile Welcome to The Gleneagles Hotel. When it first opened its doors in 1924, this magnificent countryside estate in the heart of Scotland was described as a “Riviera in the Highlands”. Today, as a member of The Leading Hotels of the World, Gleneagles continues to offer an unbeatable array of attractions that includes a five-star luxury hotel, three championship golf courses, an award-winning spa, and the only restaurant in Scotland to hold two Michelin stars. Profile The Royal Yacht Britannia, berthed at Leith in Edinburgh has been rated Scotland's Best Visitor Attraction for 11 years running and TripAdvisor's UK Top 10 for the last five years. The Queen's former floating palace for over 40 years, Britannia is now a five-star visitor attraction and exclusive evening venue. Step aboard and explore the ship's 5 decks. From the gleaming Engine Room to the State Apartments, where The Queen hosted glittering state banquets and receptions, as Britannia sailed a million nautical miles around the world on more than a thousand official visits. See where Prince William and Prince Harry spent their summer holidays every year. Where world leaders and celebrities were wined and dined. From Frank Sinatra and Liz Taylor to Presidents Mandela and Clinton. Visit the Royal Deck Tea Room for lunch or a cream tea, where everything is made on board in the original Royal Galleys. There's also a fantastic selection of gifts in the beautiful shop in Ocean Terminal Shopping Centre. Britannia's five decks are fully accessible and there is a FREE audio tour in 30 languages. Groups welcome, rates for groups of 15 or more. Please call for more information.